One of the things I’m constantly in awe of is how big the snack market is (we’re talking a multi-billion dollar industry). Pretty much anything you could want, there is- even in the natural food space. However, I still like making most of our snacks at home. I can control exactly what goes into them and once you start, it’s really easy to feel inspired. These pistachios are a family family. 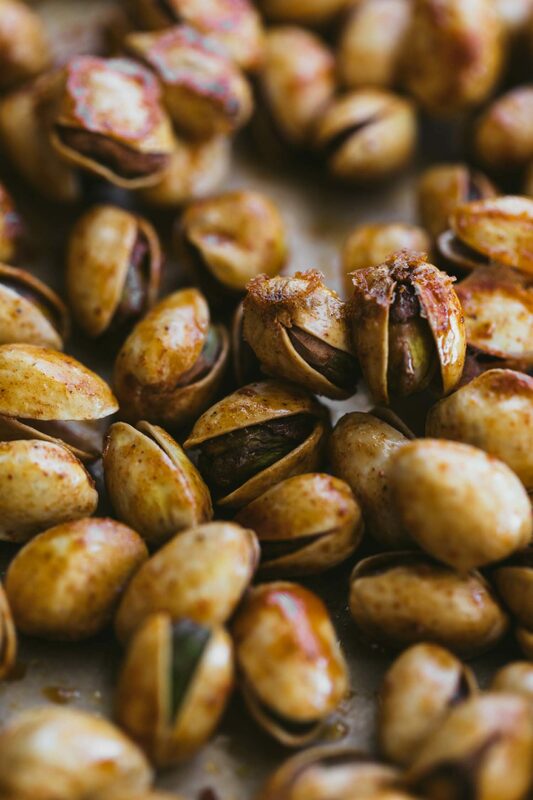 These roasted pistachios first came about when I developed a curry version for The Kitchn. We couldn’t stop eating them and from there, I’ve tried numerous spice blends and seasonings. This recipe is the perfect base that you can mix and match seasoning with different nuts (shelled or not). This version is Frontier Co-ops Berbere seasoning is the perfect balance of spicy and sweet. Heat your oven to 300˚F and place a sheet of parchment on a baking tray. In a small skillet, whisk together the brown rice syrup, pistachio oil, lemon juice, berbere spice, sea salt, and lemon zest. Heat until the mixture in warm and combined. Place the pistachios on the tray and pour the warm mixture over the pistachios. Toss and stir until the pistachios are evenly coated. Place in the oven and bake for 30 minutes. Remove the pistachios from the oven and let cool before serving. Spice Blend: Try this technique with any type of spice blend. Frontier’s harissa blend or their new turmeric twist blends are amazing. Sweetener: I love using brown rice syrup because extra stickiness of this sweetener helps bind everything to the nut. However, you could use honey or maple syrup in its place if you’re not looking to add a jar to your pantry. Nuts: Don’t just stop at pistachios! Try this spice blend with roasted pecans, walnuts, or a seed mix.